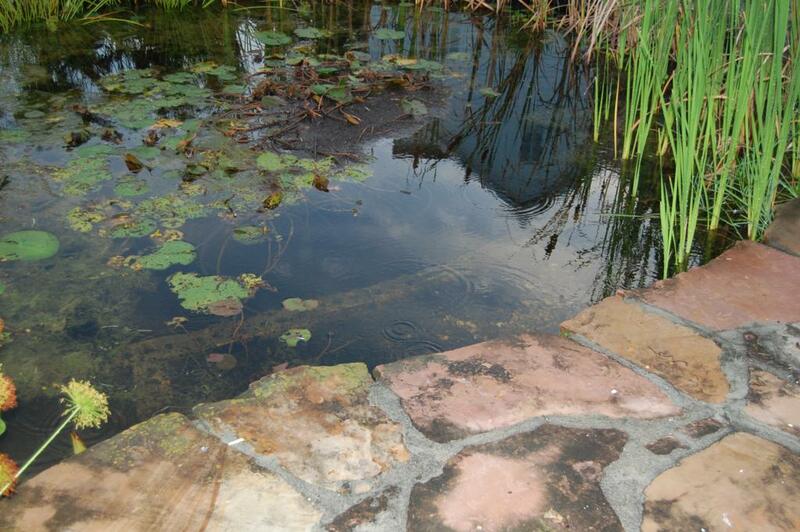 My younger son, Vaughan, built this pond in the summer of 1993. It has been sitting in our front yard since then, thriving, with just the occasional clean out of vegetation and topping up of water. It was originally stocked with some goldfish and the descendents of those fish are still in the pond. 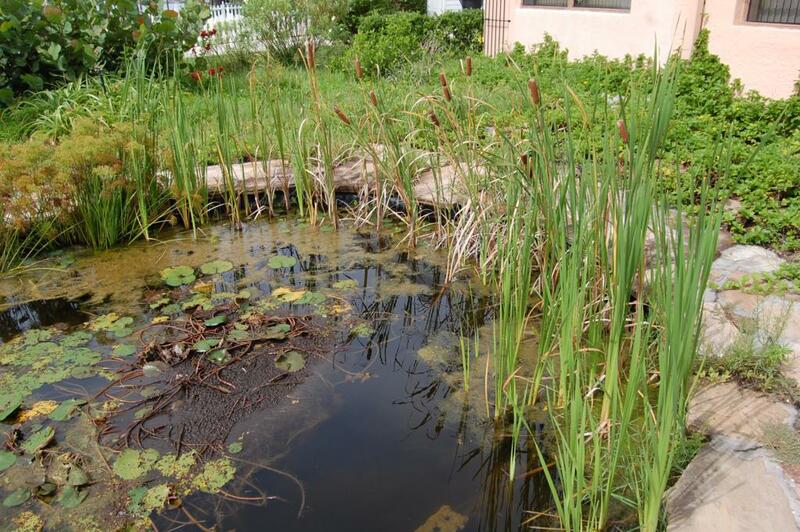 Plant life in the pond includes papyrus reed, water lilies, cat-tails and ???? 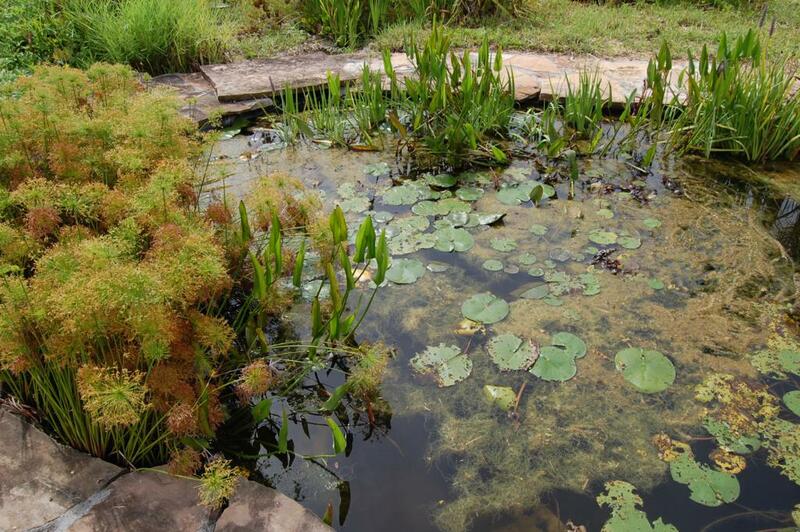 At the time these photos were taken the accumulation of vegetation has created a floating island in the center of the pond. It is a tough world in the pond and in its environs. Here we see an insect (a wasp?) which is dragging a grasshopper that it has captured and killed. 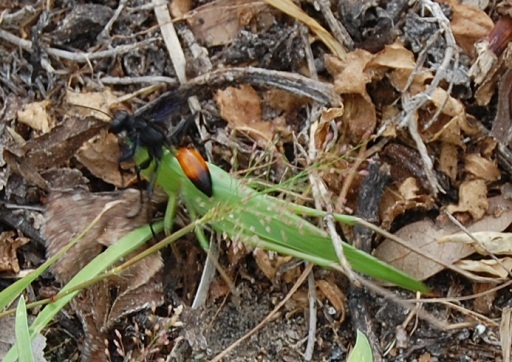 The grasshopper is quite a bit larger than the wasp and the wasp is pulling it along using its wings to provide themotive power to drag the grasshopper. We watched this as the wasp dragged th grasshopper for over thirty feet. 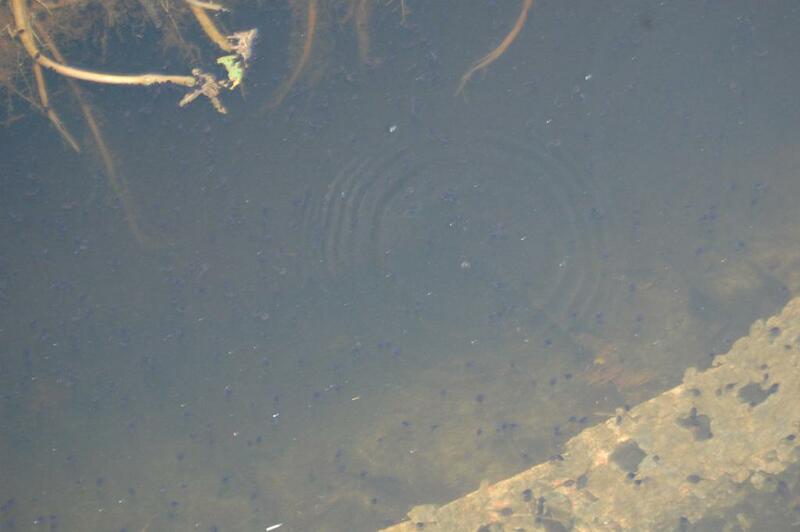 This photo shows ripples on the water created by tadpoles as they come to the surface for a gulp of air or perhaps to feed on something. 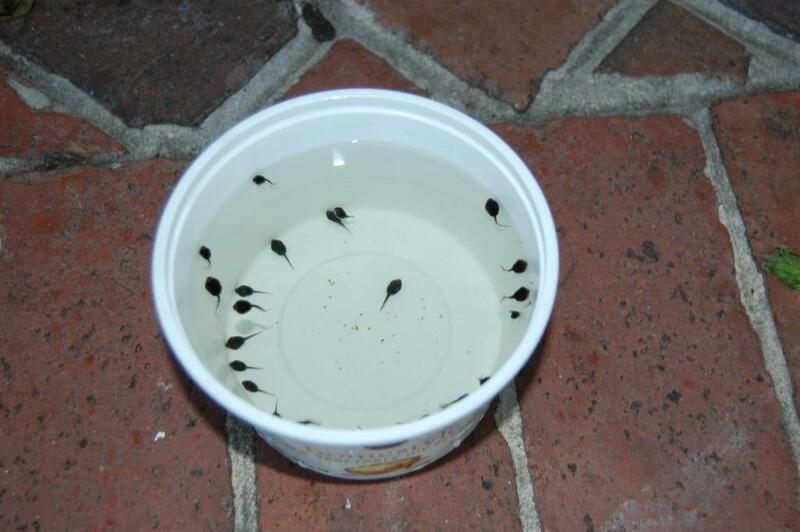 And we do have tadpoles! Look at them all -- all those black spots in the photo with little tails. 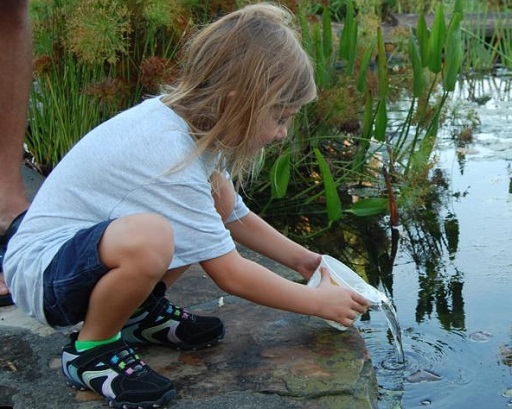 We scopped a few tadpoles out for a closer look. They are about a centimeter long. These were the result of just one little scoop. 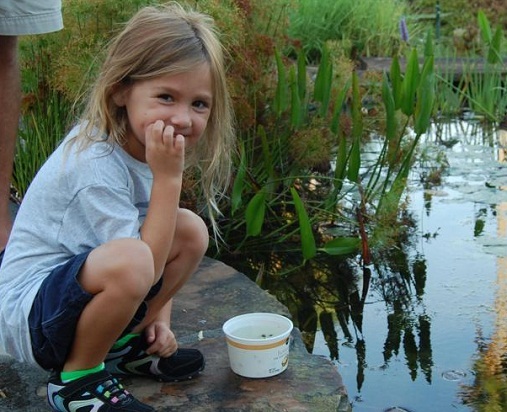 But Ava knew she should put the tadpoles back in the pond so they could grow into adults. 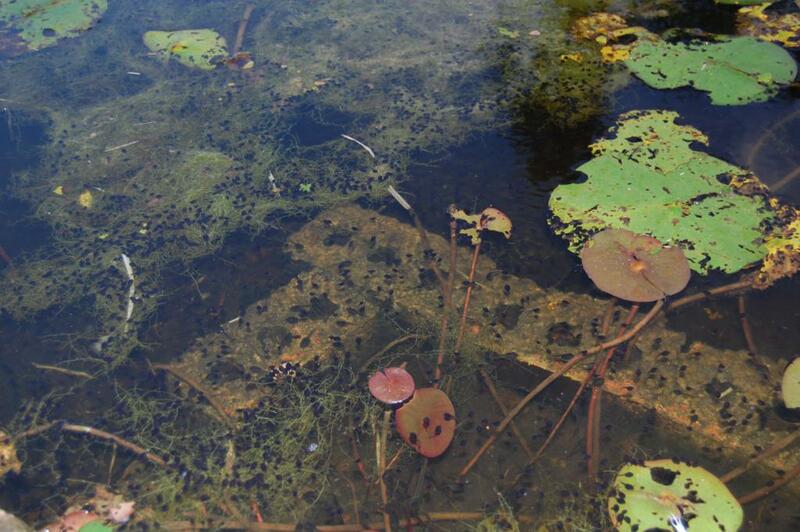 As the tadpoles get larger they change colour from black to a brownish colour on top and whitish underneath. In this photo, in the center of the rings we can see the white underside of a tadpole. Liam has not visited the pond yet -- hopefully he will do that soon.In the meantime here are a couple of photographs of Liam at a lake in Ontario in the summer of 2011. On the right is a photograph of Liam and his friend Katrina who are examining a fish he has caught from the lake. Liam loves to go fishing using worms and hotdogs as bait. And in this photo Katrina and Liam are watching as Liam's mother releases the fish into the lake.